Follow the base recipe for making the macarons. Add some concentrated brown food coloring to the mixture if you like, while beating the egg whites. Bake and cool the macarons. Melt the sugar over medium to low heat in a saucepan. If the sugar starts to dry up and cluster, increase the heat and continue to stir gently. Wait until the sugar turns light brown (caramelize), and pour the cream gently into the sugar while stirring. Let the caramel boil for a couple of minutes, until any “caramel lumps” have dissolved. Cool the caramel a bit, and whisk in the chocolate little by little. 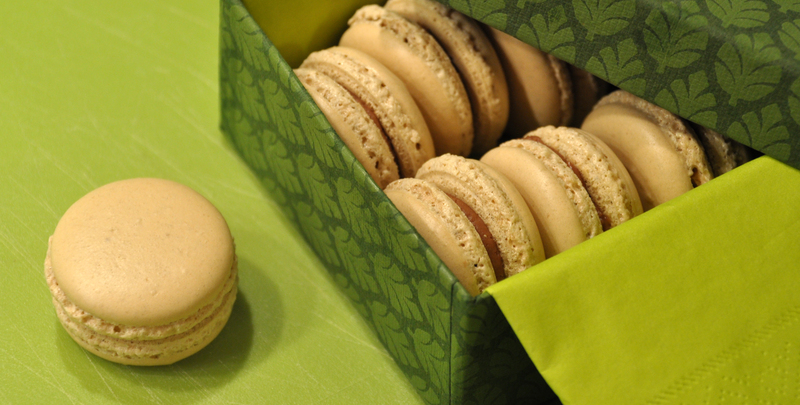 When the caramel has thickened (after some time in the fridge), you can start sandwich the macarons. If you are able to, wait until the next day, or at least until the caramel is completely cooled. (If you don’t wait long enough, it will be too runny.) Use a teaspoon, a knife or a piping bag, whichever you prefer: turn a macaron upside down, add 1/2-1 teaspoon of the caramel filling, and press the bottom of another macaron on top of it.